Though Thomas Edison failed thousands of times, he cleverly noted: “I didn’t fail, I just found 10,000 ways that don’t work.” Students today may not have the same mindset as Edison, since we are often taught that failure is bad from our earliest educational experiences. The grading system in K-12 education clearly reflects that we are encouraged “perform correctly” no matter what. Often, when students encounter difficult problems or seeming impasses, they are tempted to find the right answer without understanding the process of solving the problem. Enter, productive failure. This term refers to when students work on ill-defined problems that they cannot necessarily solve prior to instruction. Through grappling with a challenge, students often generate new strategies and conjectures; even if they don’t solve the problem, they may develop some ideas about how to solve it. Though the popular grading system does not support failure for the most part, failing might actually be one of the most efficient ways to learn something new effectively and really understand it. Why does productive failure work? When learners are not instructed on specific steps, they must struggle to apply their knowledge to the problem at hand. They also have to think deeply about the nature of the problem rather than just how to find the answer. Once they’ve grappled with the fundamental structure of the problem, failed a bit, and then finally receive the answer, they’re primed to receive the answer and connect it with their previous knowledge. Furthermore, learners who encounter instances of productive failure may be more likely to struggle through challenges in the future. What does this mean for eLearning? Often, elearning courses involve lecture-based content littered with assessments. 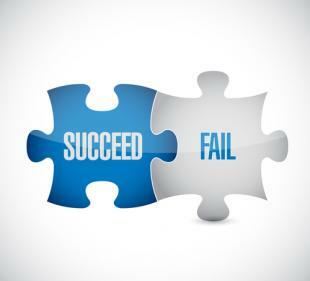 However, elearning creators can vary their designs and introduce a bit of productive failure into the content. Perhaps the course may start off with a challenging or even seemingly unsolvable question. Or, instead of making quiz questions straightforward, up the difficulty a bit and then show students how to solve them once they’ve tried on their own. Try incorporating these productive failure guidelines into your training course and see how your students succeed. Perhaps in the future, everyone will be singing the tune of Edison and celebrate a little failure.